The Young Collectors Auction preview is now open. Viewing is on until 29 September (10AM-6PM), Saturdays (12-6PM) and Friday, 26 September (2-6PM). The auction takes place Tuesday, 30 September at 7PM. The September auction provides a robust selection of work from stalwarts of Syrian art, including painters Asaad Arabi, Leila Nseir, and Marwan Kassab Bachi. A 1989 painting by influential artist Safwan Dahoul evokes both a sense of mystery and of alienation as a lone figure sits in the corner of a café littered with empty chairs, the scene rendered in warm yellow and red. Contemporary favourites Ammar Al Beik, Tammam Azzam, and Khaled Takreti, who mine archives as well as current events to create their varied works, are represented in the categories of photography, painting, and mixed media. Reflective of work appealing to an urbane sensibility are artists Huda Beydoun from Jeddah and Kezban Arca Batibeki from Istanbul. The former’s work pits popular culture characters against scenes of daily Saudi life as she creates an interaction between herself and undocumented immigrants in the country. The latter’s mixed media work superimposes sequined details onto feminine imagery that explores women's objectification as well as their empowerment. Iranian artist Farzad Kohan’s work includes various sanding, grinding, cutting and pasting techniques that are combined with newspaper clippings and advertisements in order to create a work that is minimalist and poetic, while reflecting upon the artist’s own state of migration, among other things. Afshin Pirhashemi’s latest offering is provocative in an amalgamation of the violent and the defiant, it presents a female figure rendered in multiple perspectives. Wrapped in traditional headscarf the heroine is paired against pink flowers in which a fissure appearing in the centre of the work gestures both to bleeding as well as to blooming. Please visit The Young Collectors Auction website, a dedicated platform to register, view lots and even place your absentee bids online. 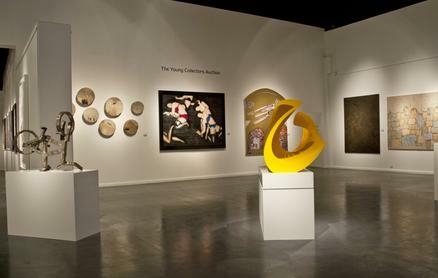 Ayyam Gallery, Al Quoz is located at the Alserkal Avenue. For more information, please email us or call +9714 3236242.